Irregular periods might occur for a number of reasons, and usually they are nothing to worry about and will right themselves without intervention. Having said this, for those women who encounter irregular periods frequently, or those who notice a significant difference all of a sudden, it is advisable to seek doctor attention. In order to determine the possible cause of your condition, it might be necessary to carry out tests for irregular periods. What Might a Doctor Ask? Irregular periods commonly occur in early pregnancy, and so a doctor will likely ask if there is a possibility that this is the case early on. Another cause could be quick weight loss or gain - women who struggle with eating disorders are particularly at risk of irregular periods. Have you been specifically stressed? Sometimes high levels of stress can influence a woman's menstrual cycle, due to hormonal implications of this emotion. Have you experienced other changes to your health? This is especially relevant to women aged over 45 because irregular periods are likely to occur before menopause. Due to the impact of contraception on hormones, a change in birth control could lead to changes in your monthly cycle. If the answers to these questions do not allow your doctor to come to an accurate diagnosis, they could request further testing. 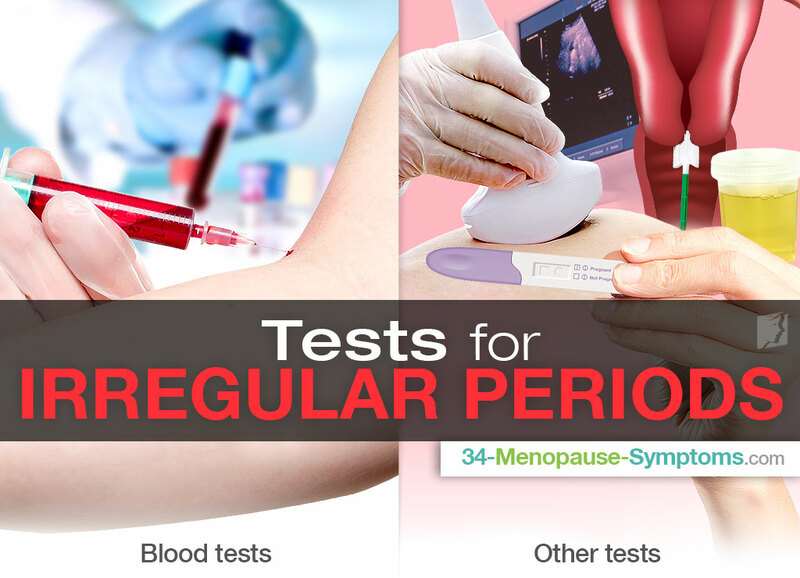 Find out some of the tests for irregular periods. Information about these can indicate whether you are starting or going through menopause, or if there is another problem at fault. If these don't provide helpful data; however, other tests might be suggested. These can sometimes reveal other abnormalities which might be causing the changes to your menstrual cycle. Generally irregular periods are a sporadic condition which does not require medical attention. In fact, most women will experience them at some stage during their lives, but for those who find that they suffer with irregular periods often, or changes are sudden and severe, it is advisable to talk to a doctor. Learn more about irregular periods during premenopause. Light Irregular Period: Is It Perimenopause? Most women will experience frequent and light menstrual cycles at some point during their lifetime. Continue reading to know more about frequent periods. What Is the Impact of Irregular Periods on Ovulation? 10% of American women have trouble getting pregnant or staying pregnant. Click here to learn how irregular periods can impact ovulation. Many menopausal women experience blood clots in their menstrual fluid. Click here to learn more about menstrual clotting and why it happens.